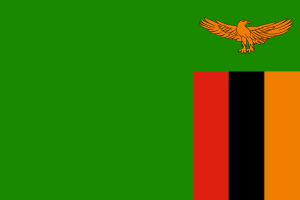 The national flag of Zambia was created in October 1964. It is completely covered in green, except with the black, orange, and red stripes at the right-hand corner. It has a golden eagle on top of the multi colored stripes. It has a ratio of 2:3. The flag's colours and emblems all have a meaning. Each of the four colours represents an aspect of Zambia: green is for the natural resources and vegetation; red is for the struggle for freedom; black is for the people and orange is for rhe mineral wealth (primarily copper). The eagle is an African fish eagle, which also appears in the national coat of arms and represents the people's ability to rise above the country's problems. ↑ "The World Factbook -Africa:Zambia - Flag" (PDF). CIA. Retrieved 13 July 2015. This page was last changed on 9 March 2018, at 07:49.